Great Ohio Breweries to Explore in Every Region - Ohio. Find It Here. 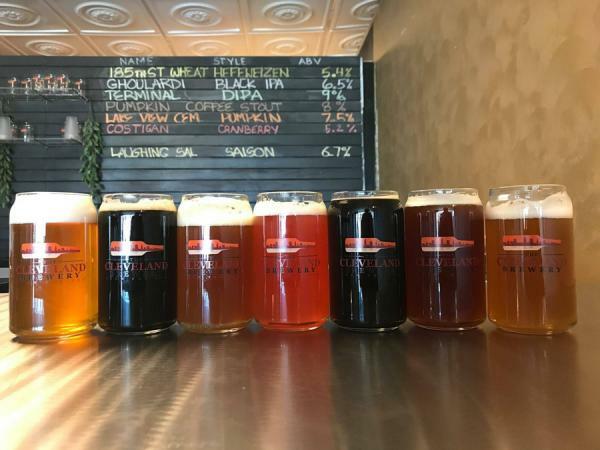 The Ohio craft beer scene continues to grow by leaps and bounds, with tons of new breweries popping up all the time and experimenting with beer styles, opening taprooms and canning their beers. And there’s no better way to celebrate National Beer Day – April 7 – than by enjoying what’s on tap. If you’re starting in Athens, home of Ohio Brew Week and of an expanding number of breweries and beer-centric bars, there’s no better place to start than Jackie O’s. Brewing since 2005, this ever-popular brewery has a brewpub in the heart of Uptown Athens college scene and also a Taproom equipped with 16 taps for you to enjoy beers straight from the source.Sample popular styles like Razz Wheat, Amber Ale and Mystic Mama IPA or Our enjoy a unique, delicious locally-sourced menu from the Taproom Food Cart. Athens second-ever microbrewery after Jackie O’s, Devil’s Kettle is owned by Cameron Fuller, winner of multiple awards over the years in the homebrew competition during Ohio Brew Week. Cameron has been producing a wide range of beers with fun names, like the Spider Silk blonde ale or the Oktoberbeast. The taproom is open Wednesdays through Sundays and has a selection of at least five house beers on tap. They also host local food trucks like Cajun Clucker. 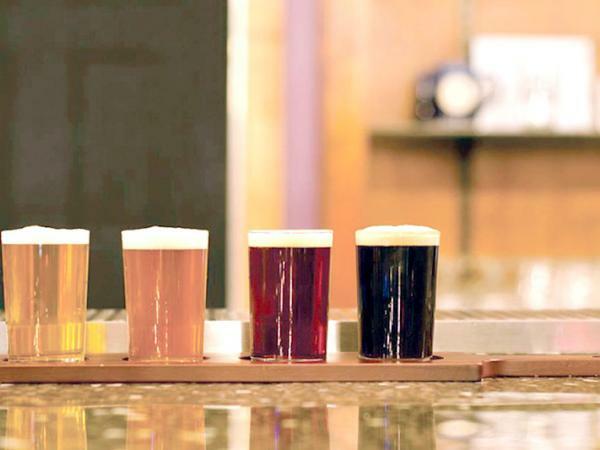 Little Fish Brewing Company opened in Athens and has begun garnering attention for its beers. Their taproom and brewery are powered solely by wind power, and they produce a range of styles, from a house IPA to a pilsner using local Shagbark corn. At the end of October they’re releasing their bottled beers, including barrel-aged and sour offerings. They installed a foeder (pronounced FOOD-er), which is a 30-barrel oak container used to age beers; they’ll fill it first with an English old ale and then a Flemish red ale. “Brewed with pure Appalachian spring water,” it says above the bar at Maple Lawn. Their sizeable taproom still feels very cozy, and their beers are all designed for easy sipping, from the fruity Pomeroy Pale Ale to the clean and clear Chief Cornstalk Colsch. I also love how their beers are like a mini tour of the region; they incorporate local produce like strawberries from Meigs County or pawpaws in the cream ale arriving in the fall. Located in the heart of historic downtown Marietta, this charming brewpub has been in operation for more than 20 years, serving of quality food and even better craft brews. Choose from a variety of styles including Estella’s Raspberry Wheat, Cooper’s Copper Ale, Hop Smash IPA, Stanleyville Milk Stout, Dunkelweizen and even the non-alcoholic MBC Root Beer, brewed in house. Central Ohio passed the 25-brewery mark and has more taprooms and more local beers hitting grocery store shelves every day. Leading the way in the Columbus area is BrewDog, the locally-headquartered U.S. offshoot of the popular British brewers. BrewDog DogTap is a large facility in Canal Winchester, just outside Columbus with a full-service restaurant as well as 16 taps — 8 house-made brews and 8 guest taps. BrewDog also offers a gift shop, brewery tours, shuffleboard, pinball, an outdoor patio and even a bike path. It also recently started its canning facility, so watch out for one of its four core brews in a store near you: Jet Black Heart, Punk IPA, Dead Pony Club and Elvis Juice. For a special treat, try to find the new Hoof Hearted Brewing taproom, which is part of the Columbus Ale Trail. The brewery – which has gathered quite a national following for itself – moved to an expanded production facility and taproom closer to Interstate 71 in Marengo. You can find specialty beers on tap, buy a four-pack of cans and even pitch in to help can beers! The first Central Ohio brewery is Ill Mannered Brewing in Powell. Developed by four homebrewing friends, the small brewery and taproom is located in a business strip just north of Powell’s main intersection. With their 3-barrel system, they rotate through an interesting selection of styles. Everything from a breakfast stout to a double IPA to a hoppy wheat can be found there. While they don’t serve food, you’re welcome to bring in food from Mojo Tago, Brooklyn Pizza, and other local restaurants. Not a fan of wild and sour beers? Kindred might convert you. 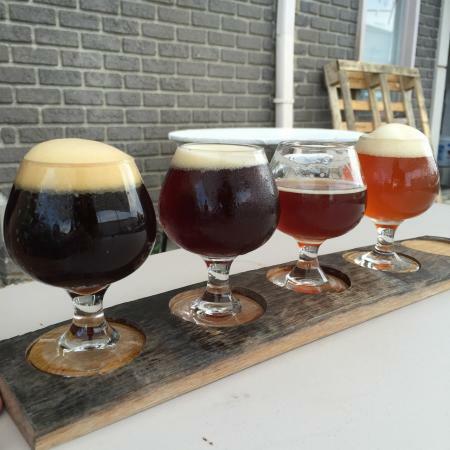 The Gahanna brewery focuses mainly on sours and farmhouse ales. Their tasting room has that comfortable, cozy-up-to-the-bar feeling. If you’re still unsure about sour beers, just think of them as tart. Sour has such a bad connotation, but “tart” conjures up thoughts of candy. Try their Farmhouse Pale Ale and Berliner Weisse for starters. You’ll also love getting to see their barrel-aging room; it’s loaded end to end with barrels for aging and blending their sour beers. Just north of downtown Delaware, Restoration Brew Worx has opened as a full-scale brewery and restaurant. Enjoy burgers and sandwiches while you try both traditional and very non-traditional house beers. You can enjoy a simple pale ale or a pumpkin ale, or go for a special like the occasional habanero IPA or the double IPA. When brewer Kevin Ely first visited the historic farm that would become the Wooly Pig Farm Brewery, he knew he had found something special. Located in Coschocton County, this farm and brewery is the first of its kind in Central Ohio. Family owned and operated, this brewery sources its beer from a natural spring on site. 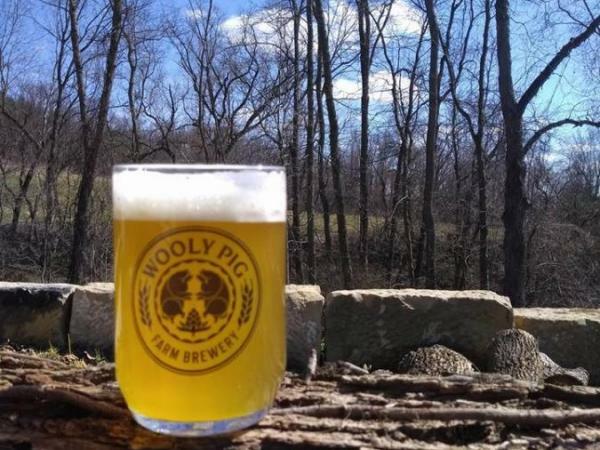 Sample what’s on tap, or head over to the tasting room for one of their specialty bottled beers — all while in the company of wooly pigs, sheep, and horses tended on the property. The granddaddy of Ohio craft breweries has been churning out great beers since 1986 and doesn’t appear to be slowing down anytime soon. Located in Cleveland’s vibrant Ohio City neighborhood, Great Lakes’ brewpub is full of history and charm, featuring a Mahogany bar where Elliot Ness once sat and a menu options ranging from burritos, ramen, and pizza, to burgers, bratwurst & pierogies and seafood. 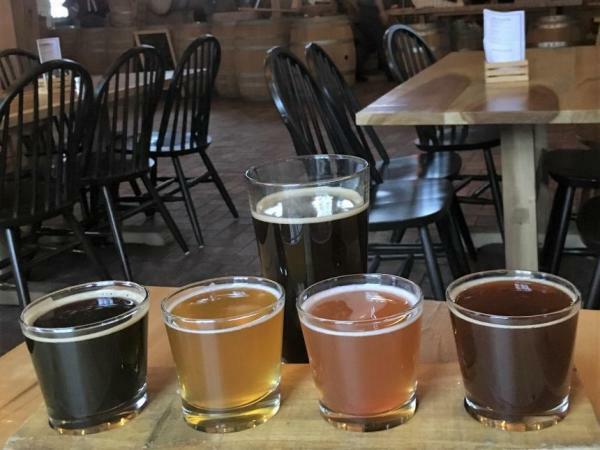 There’s also plenty to keep beer snobs attention, from an extensive brewery tour covering the history of Cleveland brewing and a look inside the facility which features a 7-barrel brewhouse where brewers experiment with new styles. Euclid finally has its own brewery and taproom! Their little storefront is a great spot to try flights of beers, sip on pints, or fill a growler to go. The taproom is currently only open Thursday through Saturday evenings, but so far they’ve been winning fans with easy-to-love beers like their Sims Beach Blonde, Session Saison, Isosceles IPA, and Moss Point Pale Ale. They’ve also started featuring some collaboration brews, like the hoppy wheat they made with Cleveland Brewery. Paladin Brewing in Youngstown is slowly building out their portfolio of house beers and has eight crafted so far. You can generally find six on tap at any given time, from the CraveMore Scottish ale to the Sir Kenneth’s blonde ale. The medieval-themed taproom is open Wednesdays through Saturdays; it’s warm and welcoming, and on Fridays and Saturdays local food vendors are on site at the tavern. At R Shea Brewing in Akron, you can meet the brewer Ron and talk to him about his vast experience in chemistry, biology and brewing. Visit his taproom Wednesdays through Sundays, or check out his website to find out where you can get his beers on draft in the Akron area. He also updates his Facebook page weekly with the latest offerings. You can currently catch him serving seasonal brews like a pumpkin ale and chocolate coffee stout. Royal Docks Brewing brings a little bit of England to Canton. Fashioned after cozy and welcoming British pubs, Royal Docks serves as a community hub, a place to gather and enjoy a couple pints of beer. They offer UK staples to complement their beer like Scotch eggs, fish and chips and Irish potato dishes. They’re easily enjoyed with a pint of the Royal Victoria IPA or the Roundabout red ale. Opened in 2016, Two Monks is a hidden gem on the Summit Brew Path, hosted by the Akron Summit Convention & Visitors Bureau. They’ve said that their goal is to preserve and perfect classic styles, although they do occasionally flex their creative muscles a bit, too. So far they’ve debuted beers like a pale ale, a Czech pilsner, and a Schwarzbier, but they’ve tinkered with fruit beers and a hefeweizen as well. One of the most unique and well-known breweries in Toledo, Black Cloister is located in the heart of downtown and featured a warm and welcoming taproom, with plenty of room to pull up a bar stool or share a drink with friends at a public table. Not only can you enjoy one of the great beers on tap, you can also tour the facility to see how the magic is done and grab a great slice of pie at the taproom pizza kitchen. There are plenty to choose from, but the Casilda of Toledo Vienna Lager is a go-to selection here, as well as the Chained Dog Belgian Strong Golden Ale — but watch yourself, it’s 9.3% ABV. When you walk into Catawba Island Brewing, just outside Port Clinton, you’ll see it’s a no-nonsense place that’s clearly about the suds. The brewery is an open, high-ceiling room with a garage door opening onto an outside deck, a generous bar, high-top black walnut plank tables and a few deep-cushioned sofas. It’s dog-friendly and offers a number of board games, Jenga, and darts, among others. And beer. One side of the room offers a clear view of a small army of steel tanks, reservoirs and an endless array of tubes, pipes, valves and brewing paraphernalia. Read more about this brewery here. The epitome of a small-town brewery, Moeller Brew Barn resides “in the Land of the Cross-Tipped Churches” and big barns in tiny Maria Stein, Ohio. Recently joining fellow Ohio brewery, Great Lakes Brewing Company, in the Top 50 craft beer producers in the U.S., Rhinegeist has become a staple of the Cincinnati brewing scene. Located in the historic Over-The-Rhine district, Rhinegeist is built within the skeleton of the old Moerlein bottling plant, which opened in 1895. The 25,000 square foot facility has a fun “industrial” feel and features a great rooftop bar, games like corn hole and ping pong and plenty of TVs. But of course, the main attractions in the beer — ranging from staples like “Truth” IPA and “Knowledge” Imperial IPA, and “Cougar” Blonde Ale to seasonal selections like “Franz” Oktoberfest, “Puma” Pilsner and “Hustle” IPA. Woodburn uses a stylized phoenix as their logo, to symbolize the rebirth of brewing in Cincinnati (a city with some serious brewing heritage). Their taproom and brewery in Walnut Hills combine modern design elements with historic touches. Their beers range from simple like the pale ale or Belgian wit to fun and complex, like the Cedar IPA, pineapple Saison, and chocolate cherry stout. And they’re starting to serve small plates from Mazunte Taqueria in the taproom! Ohio’s rich history of craft beer brewing truly comes to life at Carillon Brewing Company in Dayton. Not only is it a brewery and restaurant, but it’s also a living history exhibit at Carillon Historical Park. It is the first licensed production brewery in North America to be operated in a museum. Read all about the experience of visiting this unique brewery here. Cincinnati Brewing Heritage Trail invites the world to explore the city’s brewing heritage through a guided urban walking trail tour. The 90-minute Cellarman’s Tour is offered on Thursdays, Fridays, Saturdays, and Sundays and begins at Christian Moerlein Brewery and Malthouse Taproom. You’ll see pre-prohibition breweries, colorful murals and underground lagering rooms all while learning about the history of the region. And best of all you’ll end back at the brewery for some cold drinks to quench your thirst from all the walking. Learn more in this article. 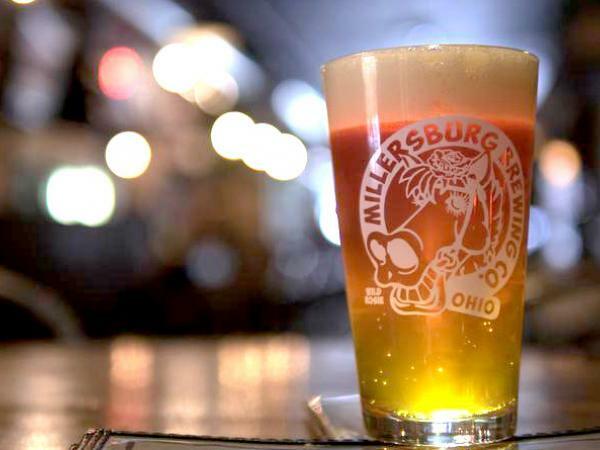 Located in the heart of Ohio Amish Country, Millersburg Brewing Company has a great tap room that offers 12 brews on tap and beautiful location in a 1920s ear building. A great place to relax after a day of shopping and exploring the Amish countryside, you can choose from a variety of brews including the Lot 21 Blonde, Black Jacket Schwarzbier, Buckhorn Maibock or French Ridge West Coast-Style IPA. Not exactly IN Amish Country, but just a short drive toward Interstate 71 and into Mansfield will put you at Phoenix Brewing Company, a unique facility located in what was once a mortuary. Phoenix likes to say it’s “Resurrecting Tradition, One Batch at a Time”, playing heavily on the area’s brewing history for a fun experience. Here you can enjoy the Danger City Brown Ale, Pale Ale 419 (named for the area code) and Melinoe Blood-Orange Blonde, among a slate of flagship and seasonal unique brews that numbers in the 30s. For more Ohio-made brews, Find It Here at Ohio.org.